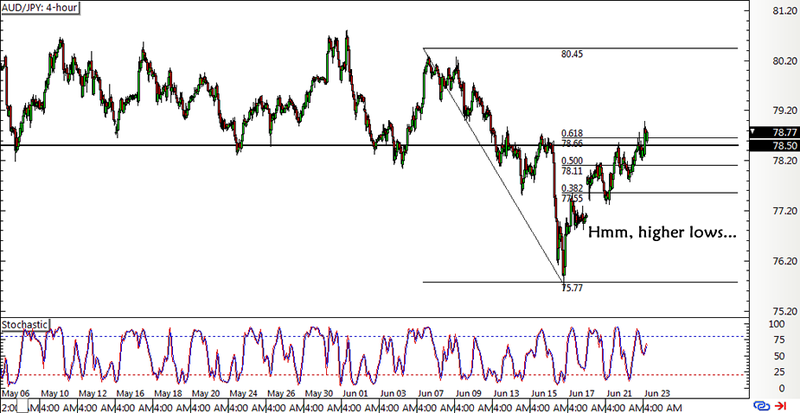 Just a quick update on that AUD/JPY setup I was watching earlier this week! Here’s why I decided against taking this short trade. As I’ve mentioned in my initial trade idea, I thought of shorting around the 78.50 minor psychological level, which lines up with the 61.8% Fibonacci retracement level and a broken support area. For a while there, it looked like the resistance was holding but I also noticed that price was forming higher lows. These higher lows suggest that bulls are trying harder and harder to push price higher so I figured that the area of interest might soon break. For now, it looks like the 61.8% Fib and 79.00 handle might still hold as a ceiling but with the EU referendum set to begin just a few hours from now, I’ve decided to just sit this one out. Besides, it looks like markets are pricing in a possible victory by the “remain” camp so risk appetite could stay in play. How about you guys? Are you taking any trades for the Brexit vote? If so, make sure you read these 5 Things to Remember When Trading the EU Referendum and Dr. Pipslow’s guide on How to Deal with Black Swan Events. Good luck!